Brian Sadgrove’s career pathway has been far from conventional. Blessed with an affinity for numbers, he was initially destined to be an accountant until he serendipitously stumbled upon art in his Matriculation year. Fortunately for the history of Australian Graphic Design, he proved rather adept at it, and accountancy’s loss was our gain. His first design job was working in-house designing BHP Review, and he stayed on for two years, completing his studies at Melbourne Tech. Publication design figured prominently in his early career, and in 1965 he began working on a series of covers for seminal Australian imprint Sun Books. Over a period of 7 years he produced a body of work which established a high watermark for publishing design in this country. In an age where marketing and sales managers now terrorise creatives, the simplicity of his covers brings a mixture of envy and awe. A consistent flow of work culminated in the establishment of Brian Sadgrove and Associates in 1968, and the studio quickly built a reputation both here and abroad. 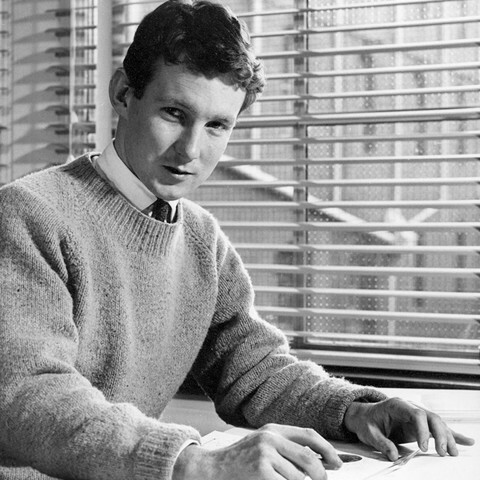 Amongst his earliest employees was an ambitious and talented RMIT graduate called Ken Cato. The compact nature of the industry fostered regular socialising and a spirit of collaboration existed quite unlike the protectionist mindset apparent today. In 1971, for example, Sadgrove and many of his colleagues formed the equivalent of a graphic design supergroup (it was the seventies after all), Emery/Fowler-Brown/Sadgrove/Whaite, in pursuit of the cherished Post Office account. Though the pitch failed, the collective stayed together for a couple of years, and parted amicably. Pharmaceutical packaging was a significant source of income for the studio throughout the 1970s, and Sadgrove’s appreciation for modernist restraint found voice in work that sits easily against the best the Swiss could do. Indeed, the word reduction pops up regularly in conversation with Brian. In Geoffrey Caban’s excellent A Fine Line – a History of Australian Commercial Art, Sadgrove, with characteristic understatement, summed it up this way: ‘I guess my recognised style is vaguely Swiss – neat and tidy.’ To label him simply as a minimalist would be misleading as his work is often imbued with a humanistic touch, but clarity and simplicity are clearly important elements in his methodology. His reductive approach is perfectly suited to identity design, and throughout the decades Sadgrove’s portfolio has included such familiar symbols as Channel Nine, Quit, Heart Foundation, Breastscan and RIO, all still in use. He designed, in collaboration with the Campaign Palace, a brilliantly confident logotype for Ansett Airlines in 1988 which consisted simply of the company name typeset in Caslon with a perfunctory fullstop. Subtly revolutionary, and way ahead of its time. Sadgrove continues to work from his Beaumaris home studio, mainly on signage projects for architects, or wine labels for vignerons, people he has known for decades; clients initially and now lifelong friends. He has also quietly fulfilled a vital role as counsel to young designers, including one of our most celebrated contemporary studios, 3DEEP. An email to 3DEEP principal Brett Phillips on the subject drew the following immediate response, and it seems an appropriate note on which to finish: ‘Brian is both a friend, a mentor and a gentleman. Over the past 15 years he has been an important influence on the outlook and culture of our practice’. Not just your practice, Brett. This text was originally published in Desktop #273, 2011.